This is a traditional Chilean snack, or maybe an appetizer. The truth is that it’s a snack eaten during winter time, especially when it rains. It is typical to arrive home after walking through the rainy streets of Santiago and sit down to have a cup of tea and eat a couple of sopaipillas. 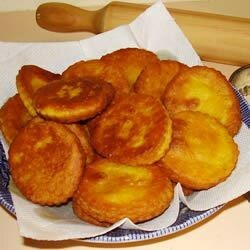 You can also eat ones sold by street vendors, but they usually don’t taste as good as home-made ones. If you can’t find zapallo, pumpkin is a good substitute. Peel, seed, and cut the zapallo into chunks. Place in a saucepan, cover with water, and bring to a boil over medium-high heat. Cook until zapallo is soft and easily pierced with a fork, 15 to 20 minutes. Drain and allow to cool slightly. Mix the flour, baking soda, and salt together in a mixing bowl, and set aside. Stir together the squash and melted butter. Stir the flour mixture into the butter mixture until blended. Turn the dough out onto a lightly floured surface and knead until soft and satiny, adding a little more flour if necessary. Cover dough with a towel and allow to rest 15 minutes. Roll out the dough to 1/8 inch thick, and cut into 3 inch diameter circles. Poke each circle a few times with a fork to make holes and prevent rising.